↑ Williams 2004, pp. 83-84, the other nine are: Bharatanatyam, Kathak, Kuchipudi, Odissi, Manipuri, Cchau, Satriya, Yaksagana and Bhagavata Mela. ↑ ୨.୦ ୨.୧ ୨.୨ Peter J. Claus; Sarah Diamond; Margaret Ann Mills (2003). South Asian Folklore: An Encyclopedia. Routledge. pp. 332–333. ISBN 978-0-415-93919-5. ↑ ୩.୦ ୩.୧ Cheris Kramarae; Dale Spender (2004). Routledge International Encyclopedia of Women: Global Women's Issues and Knowledge. Routledge. pp. 295–296. ISBN 978-1-135-96315-6. ↑ ୪.୦ ୪.୧ ୪.୨ ୪.୩ James G. Lochtefeld (2002). The Illustrated Encyclopedia of Hinduism: A-M. The Rosen Publishing Group. p. 359. ISBN 978-0-8239-3179-8. ↑ ୫.୦ ୫.୧ Phillip B. Zarrilli (2000). Kathakali Dance-drama: Where Gods and Demons Come to Play. Routledge. pp. xi, 17–19. ISBN 978-0-415-13109-4. ↑ ୬.୦ ୬.୧ ୬.୨ Phillip B. Zarrilli (2000). Kathakali Dance-drama: Where Gods and Demons Come to Play. Routledge. pp. 22–25, 191. ISBN 978-0-415-13109-4. ↑ Phillip B. Zarrilli (2000). 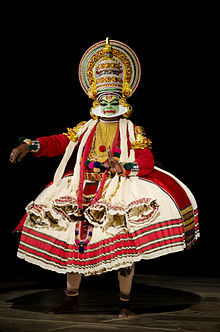 Kathakali Dance-drama: Where Gods and Demons Come to Play. Routledge. p. 3. ISBN 978-0-415-13109-4. , Quote: "Like most traditional modes of storytelling and performance in India, kathakali plays enact one or more episodes from regional versions of the pan-Indian religious epics (Ramayana and Mahabharata) and puranas." ↑ Daugherty, Diane (2005). "The Pendulum of Intercultural Performance: Kathakali King Lear at Shakespeare's Globe". Asian Theatre Journal. Johns Hopkins University Press. 22 (1): 52–72. doi:10.1353/atj.2005.0004.